The restaurant was pleasantly laid out--I couldn't see the TV in the bar area which makes me happy--with cushions in the booths, but a little too 'busy' with the decor. Living on a restricted budget I had avoided coming here for lunch as I heard it was expensive but came across a 2-4-1 lunch coupon requiring a beverage purchase so after shopping at the Dollar Tree--make out of that what you will--we went to Good Spirits for lunch. Allen had The Bolo made of Rigatoni Pasta, Italian Sausage, Tomatoes, Basil in Pecorino Parmesan ($18 lunch, $20 dinner) and an Arnold Palmer ($4) and loved it with 2 'complaints' the first being 'too hot' heat wise and he was annoyed by the basil leaves mixed in. I explained that we were right near the kitchen and pasta has to be served hot as it gets cold very quickly. 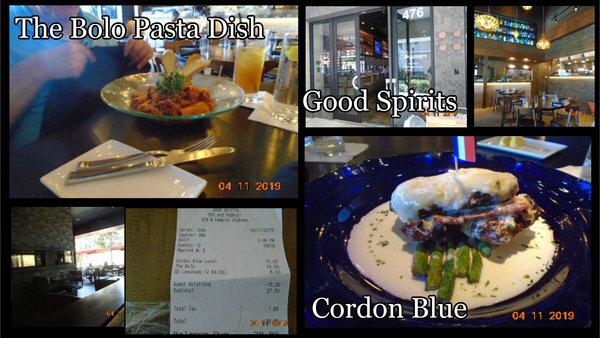 I had the Cordon Blue made of Chicken, Swiss Cheese, Serrano Ham on a bed of Asparagus and a Parmesan Creme sauce ($19 lunch, $23 dinner) and an Iced Tea ($4). It was served hot and the sauce was tasty but though I love vegetables Al Dente these were too hard consequently hard to cut. I, also, didn't care for the way the chicken was made as I don't recall ever having it breaded/fried in this dish. It was an enjoyable lunch but it is not a place I would go back to because there was nothing 'special' about it for me.